We were pleased to support the Slaithwaite Philharmonic Orchestra with a family concert given at Slaithwaite Civic Hall on March 9th 2019. 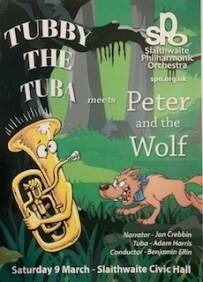 The concert was Tubby the Tuba meets Peter and the Wolf, narrated by Jon Crebbin, Adam Harris on the Tuba and of course Benjamin Ellin conducting the Orchestra. The concert was enjoyed by all who attended.